Hooray! Today I am pleased to share with you the tentative schedule for Capital MetroRail. Note the heavy emphasis on “tentative”—our planning team expects changes to the schedule based on the real-time “practice runs” that begin Feb. 12 along the entire 32-mile line. 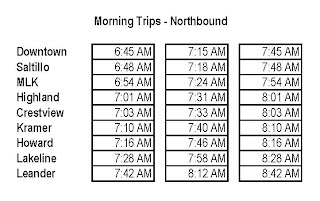 This draft schedule allows for seven SB trips and three NB trips in the morning, and then seven NB trips and three SB trips in the afternoon–each weekday. The frequency will be every 30 minutes. See the timetables behind the cut. Interesting, looking to see how it works. I’ve said this from the beginning and in all the public forums I attended and I think it is to be addressed in the second phase of the rail, but we really, really need to expand the schedule (already) to make this really successful. Please consider mid-day runs (optimally throughout the day) and please consider late night runs, especially from downtown. If I get off a job at 5pm in downtown, I get, at the most, and hour:45 for a drink or dinner or meetup with friends. That’s really not much time I don’t think. We need to get and expanded schedule ASAP. Yeah man, this is really disappointing. You know how cities have Mass Rapid Transit, this schedule is neither Mass nor Rapid. 1. I would be reluctant to take the train in the morning to work if I knew that in case I wanted to go home in the afternoon for some reason, there would be no train to take. 2. Why does it take 30 mins to go the 10 miles from downtown to Kramer? 3. I wouldn’t risk making plans to ride the train because, if I missed a train and had to take the next one, that would set me back by 30 mins rather than say 5 or 10 mins. And this is why you should vote for a real light-rail system when/if it comes up on the ballot. A real light-rail system could go places people want to go, and could be expanded as the city grew. Going from Leander P&R to 2400 Guadalupe (UT) takes 32 minutes, according to google maps (off-peak, surely; probably 60 peak); express bus in the morning is scheduled for 55 minutes for that trip. Train schedule is 48 minutes. There's zero chance the train can be unloaded, the shuttle loaded, and the shuttle trip undertaken for less than 7 minutes, so the train loses to the existing express bus option, as expected. (and this is the most favorable comparison possible as it maximizes the length of the train portion of the trip; trips from closer in will do worse in comparison). note: google badly broken today; detail on transit trips has them taking 18 hours or so! I have to agree with the other comments here. I live south and work in the domain area. This schedule doesn’t really allow much flexibility for me catching the rail downtown and heading north and then back again. I can take the train for sure but this is never going to catch on without better or more regular schedules. Getting through downtown traffic is the worst part of my commute. I was hoping that these train schedules would help with this and provide better options of getting to and from my destinations. How does one get to the airport using the train? Which bus does one take at what point? Good idea to publish others would have an interest in becoming “green”. The train needs to be open on the weekends till 3:00at night. If the train was open We could take the train for a night on the town with some drinks and safely get back home. This would really cut down the number of drunks on the road.It would also be nice to take to downtown for a weekend event that parking will be hard to find. I am a huge supporter of Rail, but gotta say, this is a huge disappointment. I would have thought there would have been continuous service throughout the day, maybe at longer intervals, but at least something. Also, I agree with the others regarding later service in the evening for those of us who work Downtown and would want to meet for dinner/drinks before heading home. Also I would have thought there would have been some sort of service on weekends for special events, or for those who want to go Downtown for dinner, events, etc. Big disappointment Metro. You guys could have done alot better. Wow – 57 minutes??? Way to kill any reason to take the train in the morning. Can we still take the bus? It only takes 40 minutes. I guess for some of the problems- such as getting back home if you wanted to leave work early or in mid-day there would be other (bus) options, which may or may not put you right back where you started- probably a hassle anyway. But, the train won’t be in a vacuum I guess is what I’m saying. Will there be a bus component after service hours in the afternoon or midday that would connect morning train riders back to the other stations? That would be a good service in the meanwhile before they start midday and expanded train service hours. I concur with others who have suggested that the schedule be expanded into the evenings and weekends. This would allow downtown workers to stay late if needed, and it would allow suburbanites (like me) to more easily enjoy downtown events, entertainment, and dining. (Traffic and parking are the main reasons I rarely go downtown anymore.) Seriously, the train stops at the Convention Center 2 blocks from 6th Street – how can people not want to use it for non-work things? How do Northbound and Southbound trains criss cross where there is only one track? I don’t understand this schedule. It seems like it was designed for a very narrow set of people. I especially don’t understand why there is no weekend service. I would imagine that there would be an entire set of people who would ONLY use it on the weekends to go into the city. I am a huge proponent of trains and alternative transport but with this schedule, I will never be able to ride the train, even just to try it out. Please try again, Cap Metro. Yes, this seems like a recipe for an unsuccessful system. Even running hourly trains during the non-peak hours would be better. Making the rail only useful for such a small set of commuters will never set it up for an expanding service, potentially making this a failed system and an argument against future rail developments. This is deeply disappointing. So you can go ahead and fire away all the reasons you think I won’t be riding it after a week; I don’t care. I’ve hear them all. I know some of you WANT this thing to fail, like a smoker wants all his friends to keep smoking. Misery loves company. 1. I can get rid of that gas eating bubble that keeps me isolated from the rest of the world for 100 minutes every day, and ride my bike to the train station, then to work after I get off the train. My calculation puts my commute time slightly faster this way, but I would do it even if it increased my commute time, given I won’t be trapped in said bubble. 2. I can get rid of said bubble, saving a $300/month car pmt, $50/month insurance, $60/month in gas and who knows how much interest and repair costs. And I won’t need another vehicle when this one dies so there’s another $15,000 or so. That’s $20/month plus $15,000 every 5 years. If I do that for the remainder of my career (not likely but a fun calculation) I would save $259,200 if I worked 30 more years and got 20% interest on a loan every 5 years for a $15,000 loan. That’s $8,640/year or $720/month in more realistic numbers. 3. #1 and #2 are enough. We welcome everyone’s feedback and I just wanted to reiterate that this is a “starter” line. The 30 minute frequency is what we plan to start service with initially. We only have six trains and one will be held in reserve for maintenance. Right now, there are only three siding tracks that allow the trains to pass each other. And, of course, the main kicker which most people forget – we ship freight on our rail line. Freight trains will run mid-day; hence the reason for no mid-day trips initially. And, freight trains will run overnight and on the weekends. We’re already working on expansion plans for MetroRail. Even though it would take about 23 months to receive new trains from the manufacturer, we could build more siding tracks within a much shorter time to provide more frequency. We’re also not expecting all of our bus customers to leave the bus; otherwise we wouldn’t be offering Express routes that mirror the rail service. The bus will still work for some people. We expect the train will bring some new customers. Plus, passengers on the train will not have to worry about getting to work late because of a major traffic jam on I-35 or 183. The train will provide a consistent schedule that many people will be happy to rely on. I hope this helps you understand the reasoning behind this tentative schedule. Matt, you ought to be taking the (very good) express bus today if you truly feel that way. Misty, the train will not be more reliable than the express buses, most likely, because the shuttle bus trips will be exceedingly slow and exceedingly unreliable. I’m looking forward to it and will enjoy the ride. Anyway, correct me if I’m wrong but I could swear that capmetro’s been saying for a few years that for starters the trains would only run during rush hour times. Anyone who’s surprised by that today must not have been paying attention. Starting off in rush hour makes sense to me. Isn’t that when there’s the highest demand for travel? This is Commuter rail but what about people who aren’t commuting? This train schedule really forgets those who may want to ride the train for entertainment and recreation downtown. I moved from Houston almost two years ago and I was excited to learn of a train to downtown that I could ride from Lakeline but now I see that that rail line will be pretty useless to me and those like me who don’t work downtown. Nice try CapMetro. I will wait for expanded hours of service but I am disappointed to say the least. I think that Round Rock and Georgetown needs to be a part of this! Then you would see more people riding the train!!! We built the tollroads and already they are getting jammed packed with cars! As feared, the new cap metro metrorail service is heavily weighted toward commuters from the ‘burbs even though most of the cost is borne by austinites. I am disappointed that there are only 3 trains going north in the morning and south in the afternoon. The number should be more balanced between north and south runs both in the morning and evening. One thing I can say in praise is that the time to commute between the Howard and Downtown stations is only 31 minutes in either direction. This makes it worthwhile to take the train if I can make one of the 3 runs. Again, more so-called “reverse commuter” runs are needed in both the morning and evening. Worse for “reverse commuters” than the schedule is the lack of circulators at the suburban stations. I work at Parmer and Anderson Mill (nominally inside Capital Metro’s service area), and even though the rail goes fairly close, the nearest station is around 3 miles away — only slightly farther than the nearest bus stop. I will reserve judgement since it is clearly part of an initial ramp of service. Many people have mentioned expanded service and I would like to mention to key usages which I would hope are considered. First, as others have mentioned, this is a great and safe way to have people experience the downtown nightlife on any day of the week. Second, it also could allow Austinites to travel to the Leander area in the evening for various events, visit relatives, etc. Cedar Park is about to open an event center which will host a Dallas Stars minor league hockey affiliate among other events. I would find it to be a more relaxing experience if I could hop on a train for such events. Be aware that any ‘ramp’ up of service will still not handle the fundamental problem: this was (mis)-sold as ‘light rail’ and ‘urban rail’ and various flavors of same to many people, which is why they’re now surprised and disappointed to find standard commuter rail service (infrequent operation at restricted times to few destinations). When CM buys more trains, they still won’t run to UT, the Capitol, or to most of downtown. They will never run by the Triangle or by Hyde Park or down South Congress. This technology that can’t ever really run in the city like true light rail would have locks us into the quixotic task of convincing people who won’t ride the bus today that the train is great even though it’s going to force them to ride shuttle buses. M1EK is a classic naysayer! The express bus is less convenient and would take longer than the train from my location. And I would still be sitting on Mopark with the rest of you; though having a driver would admittedly be slightly less stressful. You can’t argue with the point Misty made: “passengers on the train will not have to worry about getting to work late because of a major traffic jam on I-35 or 183 (or Mopark). The train will provide a consistent schedule that many people will be happy to rely on.” M1EK enjoy your bus and maybe you should stop trying to pee in everyone’s cheerios eh? There are double tracked sections where they are timed to pass each other at a number of places along the route (from what I have heard). These people, including me are NOT against rail transit or transit in general, we are FOR transit and we are upset that this doesn’t seem to be responding to customer’s needs (which have been repeated over and over again to every meeting I’ve been to about this) about having expanded service hours. We want this to be successful and we want it to serve as many people as possible. Matt, actually M1EK is a constant (I’ve even said in the past a far too constant) voice for a high-quality multi-modal system for Austin. He is not a naysayer of rail or of transit. He opposes the red line as ineffectual and even hurtful to transit in Austin. I agree with him on some, but not all points. He’s correct that what is needed is light rail or other non-commuter rail to serve true urban locations directly. This is a project geared at funding and relocating freight rail out of the city centers and this would probably help expand passenger rail in the Austin area. Matt, I’d be curious why you think the express bus is somehow less convenient. Unless you actually work right next to the Convention Center or the MLK Station, the express bus will take you straight to your office, and based on my own analysis, likely be quicker than the combination of train+shuttlebus. Martin, thanks for the kind words, but there’s a big problem with the “it was never sold as X” approach – it WAS, in fact, sold that way – with the artless attempts to claim it was really ‘light rail’, or the branding as ‘urban rail’ (with or without ‘commuter’ in between). When you say things like that, you make people think it’s going to be like DART or MAX or light rail in Denver or Houston or Minneapolis or Salt Lake. But it’s not light rail. It’s not urban rail. It’s standard commuter rail service like Tri-Rail did, and it’s not going to be able to do anything for us that Tri-Rail didn’t do for them. And, no, people won’t transfer to do that stuff. Not people who can drive, anyways. Transfers kill ridership among choice commuters, even in Manhattan. It seems as though M1EK assumes that commuter rail and passenger bus services are two substitutable services. That is, commuter rail will only siphon off ridership from express buses rather than enlarging the number of commuters. Is there any empirical evidence that substantiates this claim? Presumably, when commuter rail is introduced, if M1EK’s argument is valid, passenger bus ridership will fall or remain flat, while commuter rail ridership rises (or doesn’t). However, total ridership in the transit system will remain static. Anecdotally, I don’t commute by bus (although I ride the #5 from Crestview frequently) but I intend to commute by rail (the #5 is rarely on time from my experience, bike storage is quite limited, and I find it not nearly as comfortable as the commuter rail I’ve ridden while living abroad which, FWIW, did require a non-negligible bike/walk to your ultimate destination) I wonder how widespread this sentiment is? After all, the commute by commuter rail for me will be a comfortable, wi-fi infused 18 minutes compared to 35-55 minutes by bus. M1EK, I wouldn’t even say its a commuter rail. I moved from San Jose, Ca, we had both Urban Rail (CalTrain), which had service through out the day and weekends, as well as explicit Commuter rail (ACE and the Capitol Corridor), which only ran during work hours. We also had light rail ran by the local transit agency. MetroRail fits neither of these three and seems to be a horrible hybridization of all of them. The route it runs is far too small to ever be effective being run with commuter level service, if it was stretching out to Georgetown or further south to San Antonio,it might have potential. Also, transfers and shuttles do work when the commuter is coming in from far enough away and on roads where traffic is in high enough volume that mass transit actually saves time. i.e coming into Austin from 60 miles at an average of 15mph by road vs 45-50 by rail. The commuter would for sure be happier with a direct connection, but if there is a legitimate savings of time, they’ll take it with a transfer. The red line offers neither for most commuters. For those of you wondering why the initial service level seems to pathetic, remember that many of these tracks also service freight trains. It is against the law for commuter rail and freight trains to share tracks during the same operating times. Therefore, freight trains will run at night and commuter rail during the day. If Cap Metro wants to expand service into the evening, they will have to re-route the freight traffic. I’m all for that! This is ridiculous. Why aren’t trains going to be running at night? “The Error Term”, the contention is that trains that require shuttle-bus transfers are unlikely to attract many riders who are currently unwilling to use the high-quality express buses which go straight to the major activity centers (without requiring a transfer). Those 98x buses are a lot nicer than the #5. 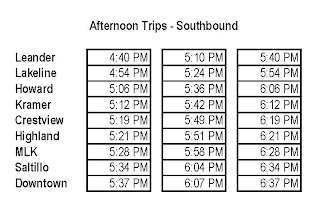 If you’re planning on using the train instead of the 98x, you’re being very optimistic about the shuttle-bus times, according to Capital Metro’s own schedules (has to be less than 7 minutes for full loading + trip in my UT example, for instance, or the express bus is quicker). sirius-fox, most people would call CalTrain “commuter rail” as well. Commuter rail doesn’t mean there’s no service throughout the day; the LIRR is a commuter railroad too. Dustin Breithaupt, that isn’t exactly true. Yes, CapMetro can not legally operate their trains with the freight service, it isn’t because freight and commuter can’t be run at the same time. It has to do with the style of train that was purchased, which the Federal Railroad Administration put that restriction on. All the commuter rail systems that I am familiar with (Caltrain, ACE, Metrolink) all operate during hours of freight operation. M1EK, that is very true, I used the term Urban Rail to distinguish it from the rail lines that cater only to commuters. By my metrics, “urban rail” doesn’t apply to CalTrain either. “urban rail” has to make a bunch of stops in areas that are urban, which CalTrain does not. “urban rail” would be the NYC subway, DART, Houston’s light rail, Washington’s Metro, etc. Could be light or heavy; but must be suitable for urban dwellers to use within the urban area itself. M1EK, you’re right. That was my bad for using the wrong terminology. CalTrain doesn’t fit the standard definition of urban rail. Interestingly enough though, CalTrain never left urbanized environments but still, as you said, doesn’t meet the definition. M1EK: So, my paraphrasing of your stance was correct. But, I do have to ask again, without coming across as daft: is there any evidence that this is the case? That is, did the introduction of commuter rail not increase total ridership? Or, did it just appeal to those that had previously commuted by bus? And, it seems as though your predictions are assuming alot as exogenous. Alternative commute times (namely by car or by bus) stay constant and fuel prices remain stable. Is there any reason to assume this? Might these considerations mitigate calculations about the tolerability of the shuttle-bus connection times (which I don’t intend to use)? FWIW, I’ve also ridden the 101 but, again, I find this less comfortable than my commuter rail experience, and bike space is severely limited. That being said, is it not conceivable that prospective commuter rail users have a more positive impression of commuter rail than bus service? Might this bolster demand? The #101 is not what I meant – try the #98x buses. Yes, it is possible (likely, even) that people have more positive opinions about rail. Once they have to take a shuttle-bus as part of that commute, the advantage is completely lost. And, by the way, the same traffic making the buses get slower and slower will obviously make the shuttlebuses get slower and slower as well. The rate might be slightly different, but the (train+bus) is already starting out at a large disadvantage in time and still has the hassle inherent in the transfer. Again, if you’re going to take commuter rail from far out but you won’t take the 98x buses today, you’re, well, not fully exploring your options is the BEST way I can put it. And if you’re comparing commuter rail from, say, Lamar/Airport (hence the #101 comparison), you’re kind of a fool – the long trip out east and back in again will totally kill you. If the train can’t be run at 30-minute intervals during the day (an interval that would be usable for most folks) CapMetro should at least run a rapid bus service that shadows the same route as the train, and is available between 6 AM and 9 PM, preferably running every 15-20 minutes. This would allow regular train commuting, but give people an option in the case they got stuck without a train to catch. also, cast my vote for more outbound morning/inbound afternoon train runs, as my husband and I live cnetral, and he works at IBM. I remember specifically knowing early on and saying early on that it is silly to have this only as a commuter-based service. I don’t think there was any trickery or anything- I never remember thinking it would be the end all be all of Austin rail or it being sold in that way. I think CapMetro did have to do a dance around the wording and branding- not so much for the public as for the FTA- and I didn’t see any incredulous motive there. Also, when it does come to marketing I don’t blame them that they didn’t go to the public saying they are putting in a DMU commuter rail… They did have to put it in terms that the normal public would understand. I don’t think this was misleading, just aimed at making sure the public was well informed. As for rail relocation- I think that this is important not only for the red line, but for the entire possible buildout of urban rail in Austin, including ASA rail, eastward commuter rail, and red line expansion, etc..
As I’ve said before, I’m not pleased 100% w/ the red line, but I’m not ready to can the whole system, I’m looking to the future. You’re right, I think there are more factors that will be affecting people’s choices once this is in place than the few we’ve explored and that M1EK has focused on. I think if one focuses only on farout/Leander to downtown connections exclusively, you are missing other factors and possibilities such as the one you describe that will prompt you to ride rail. You also won’t have to worry about the limited service hours as it seems you know the #5 and 101 can also get you home when needed. I’m a current bus commuter who will use the rail for a ‘reverse commute’ from 2 mid-line stations (central Austin – burbs), so I don’t think that the shuttle bus will be as big a negative factor as M1EK has supposed. Ahh, I see. I have not tried the 98x buses. Although I do share your annoyance–and others, hence the “transfer penalty”–with the shuttle bus transfer, my concern is that you’re assuming quite alot by just declaring that riders will reflexively balk at executing the transfer. Thus, the so-called “transfer penalty” is a constant. This is not so, and there’s quite a bit of academic research attempting to quantify this term–in fact, it can be conditioned on the location of transfer, for instance. In fact, a wide range of variables shape riders’ willingness to tolerate this, which is why I’m asking for some empirical evidence that supports your dire predictions. Is the Austin experience too idiosyncratic to compare to other cities foray into commuter rail? I do agree that the loop around the city is frustrating but, again, its a shorter, more comfortable, trip than the bus, according to the schedule. And, perplexingly, the 101, despite its moniker, doesn’t even ply straight down Lamar (none do, actually, they veer towards where “people want to go”, as you’re fond of saying), which puts a wrench in my commute. So I’m left with a transfer (either at 12th on the 101 or 45th and Guadalupe on the 5, both quite grim–transfers are not all the same! ), regardless. This is a N=1, so who cares, really. Without data, we’re (both of us) are really just speculating. Capital Metro Staff: I assume you guys collected some data to forecast ridership. Can you shed light on this discussion? Any survey data? Any attempt to incorporate the “transfer penalty” into your forecasting models? Eduction First, it wasn’t just a dance for the Feds; Capital Metro operatives like Lyndon Henry were arguing that this was a “light” urban railway from day one. It’s not light; it’s not urban. Urban would require that it serve intra-Austin trips which didn’t require a car or a bus transfer. Light would require that it be capable of operating in the street on a turning radii that didn’t require excessive acquisition and demolition. You can tell from this very thread that people believed Cap Metro when they talked about how this would be an urban railway. It doesn’t even matter whether you believe _me_, you just need to read this very thread. "Going from Leander P&R to 2400 Guadalupe (UT) takes 32 minutes"
In your dreams on a workday. That will take AT LEAST an hour using 183A, more if you use 183. And there is probably that one or two days a week you'll have indefinite delays due to wrecks. I might be able to pull 32 minutes off on my motorcycle on Sunday morning using 183A, but even that would be a stretch. Sorry, guys, was posting from my stepson’s computer and didn’t notice he was signed in to google. D’oh. Jim, I did say “probably 60 peak” with regards to the car commute. The Error Term, you make it sound like you need to go all the way down Lamar rather than following the #1 corridor? Hard to tell from your comment. But if that’s the case, then it’s even less likely commuter rail will work for you – a shuttle (or regular) bus transfer from one of the rail stations has that much farther ‘back in’ to go. More clarification at this point would be really helpful. As for riders balking at transfers, this is the result of study of many cities all over the country (and in the rest of the world). Austinites are not as exceptional as we like to think – we do not, in fact, have the ability to stop time, so the time and hassle involved in transfers discourages ridership here just like it does everywhere else. That’s the model that Dallas, Houston, Salt Lake, Portland, Denver, Minneapolis, […] used. NOT this “well, it’s just a start; people won’t mind shuttle-bus transfers” nonsense. M1EK, I think it is a bit extreme to say that it forever prevents that from happening. It is however a lot less likely as it would mean building a elevated or buried rail line through those areas. If you factor in a rail to rail transfer, it becomes more possible to service those areas. Going from commuter rail to light rail does still incur a “transfer penalty”, its less than that of a (shuttle)bus transfer. Even if it is sharing right of way with other cars, they are typically setup with their own lane. Dallas has just this setup as all of DARTs Lightrail lines connect to a TRE station. Realistically though, it would be silly bordering on inane to build just one spur line off the red line to service areas missed. If they were to do it, they should sit down and establish a long range, long distance service map. Given the sentiment found just on this blog, it would seem that such a thing would be a rather hard sell. sirus-fox, it can effectively never happen. The technology they’ve chosen prevents a spur; and rail-rail transfers hurt ridership even in Manhattan (those studies that show an 80-85% acceptance are obviously restricted to cities with more than one rail line – a fairly limited sample which tends to have MUCH worse driving conditions than we ever will). As for your theory that this is somehow a minor issue – this means that West Campus and most of UT and the Triangle and the medical complexes will never get rail transit unless we can somehow do a complete end-run around Capital Metro. Those activity centers are orders of magnitude more important than Mueller and orders of orders of magnitude more important than anything else along the commuter line. It’s amazing what gyrations people will go through to excuse avoiding the primary transit-positive activity centers in our region. Smarter cities simply don’t do this. Indeed, I do have to go straight down Lamar–6th and Lamarish, in fact. And, I’m aware that taking rail does require me to go “back in” further than if I had been dropped off at 12th and Guadalupe on the 101. However, and again this is critical, I’m choosing to take the commuter rail over bus for the reasons I enumerated above. This is not an irrational calculation. Again, though, this is a N=1, so very little can be gleaned from this. At this point, I think we’re talking past one another. I wholeheartedly acknowledge that a “transfer penalty” exists, as do you. Nor do I think that us Austinites, through our “exceptionality”, are somehow inoculated against this. However, the magnitude and the determinants of that penalty are conditioned on by a host of factors (just perform a Google Scholar search of “transfer penalty”+rail or “intra-modal versus inter-model transfer” and you’ll see what I mean.) There’s quite a bit of intellectual spadework being done to quantify this parameter, but your formula for predicting ridership seems to be, crudely: ridership=demand-transfer penalty, where transfer penalty=-1 for everyone (no variation) and demand=1, which leaves overall ridership at 0. I find this wholly unsatisfying and it essentially invalidates all research on the subject. And, I’m entirely unconvinced that, as my original post mentioned, rail and bus are perfectly substitutable, even given existence of a transfer. We need data before we can make such sweeping statements that commuter rail will fail in Austin because of the transfer requirement. Again, perhaps the Capital Metro folks have some data to contribute to this dispute. I doubt they’d invest so much public money without forecasting demand. It’s true that I’m simplifying the issue, but then again, things become simpler in aggregate. Rail starts which have gotten non-trivial numbers of previous car commuters to ride all have one thing in common: they hit major activity centers without transfers. Honestly, I can’t see any reason why you would take commuter rail in your circumstance, unless you’re planning on doing the last leg via bike. It doesn’t make any sense – it seems like you’re doing it just to spite yourself. The 98x buses run down Guadalupe/Lavaca in that neck of the woods, too. So my husband can use the light rail system to get to and from work, however, he usually doesn't leave the house that early (it only runs so late in the moring) & will have to leave work earlier then he usually does (b'c it stops service so early). He is excited about supporting this project so I think he'll do it – sometimes. I'd like to be able to ride the rail anytime into downtown to do some afternoon events, convention center events, or shopping. But that doesn't look possible because of the lack of options. Katie, it’s not light rail. Not even close. Light rail would be capable of running down Lamar, Guadalupe, and Congress – where all the real density is and will be for the foreseeable future. It’s simple: ordered preferences. (And, yes, I do intend to execute the transfer by bike, as I stated earlier.) I prefer rail to bus and I’d like to minimize bus time, however possible. In fact, I would choose rail even if the comparable bus ride was as convenient (it is not) and was shorter (it will not be). I don’t think this calculation is an aberration, either. Again, this is the fallacy in your logic. You’re assuming they are perfectly substitutable. This is not true. Although you point to those systems that have succeeded as having touched dense areas of activity, what about those that have failed? Or what about those that have succeeded that relied on connector bus service? Did all of them not touch major activity centers and required transfers? Or, as I asked earlier, is Austin too idiosyncratic to compare? If so, you should be far more prudent in declaring this project will fail since you don’t have evidence to support this claim. It looks as though Nashville’s commuter rail initiative is similar and ridership continues to increase. Or, what about the New Mexico Rail Runner? I would have also liked to have seen more reverse runs and at least 1 late rush hour scheduled trip. Forcing people to ride during the rush hour doesn’t really fit into when many people work these days. I don’t typically leave the office until 6:30. I don’t know if I have anything scientific to contribute to this. But, I just returned to Austin after 3 (blissful) years of not driving a car while living in NYC. I do miss the train so much. Anyway, more pertinent to this bus vs rail transfer issue. NYC is a weird system but useful. I knew a lot of people who would never jump on a bus there even though some of them were damned good. They simply had the reputation of being slow. Some reputations deserved, others not. For example, buses here in Austin seem to drive much slower and open/close doors with much more pause. Maybe it’s just me. Anyway, I think that people who I knew that didn’t grow up on mass transit (but lived in NYC) had some sort of built-in mental rejection of buses to rail. I don’t know how to quantify that but I just saw it. I don’t know that the same will be true here. Let’s see after a few months. I’m really hoping to see the rail ridership exceed the estimates. I want to be able to ride the train at night for fun (as it doesn’t go anywhere near my work). Moreover, I REALLY want it to get me to Highland mall from downtown so I can xfer to Nelson field for an Austin Aztex game on Saturday nights. Regarding the idea of commuter vs urban rail, I understand where Mike is coming from. But, I do think commuter rail serves a purpose. It’s just that it should have come second not first. Austin taxpayers are footing the bill for Cedar Park’ers to ride our rails. Not fair at all. Might as well just drive up there and deposit cash in their mailboxes. Nevertheless, a mix of urban and commuter rail is great if done correctly. It all depends on your lifestyle I suppose. While in NYC, I rode the subway all the time to get places. But, my wife and I had friends in Yonkers (your equivalent is Leander/Cedar Park). We rode the commuter rail (the LIRR) on Saturday’s to go see them. There was no way I was gonna drive to go see friends. And, I could drink and have a good time and catch the last train home at 11PM. It would have been nice to stay later than 11, but that was good enough. It surely wasn’t 6pm. Geez. Keeping my fingers crossed that we can lobby CapMetro enough to force them to support Austinites. That being said, I think M1EK and others allow their lingering disappointment over the rejection of the 2000 proposal cloud their assessments of the feasibility of commuter rail here in Austin. And, your anecdote about commuters preference for rail over bus does have some empirical grounding. As for commuter rail supplementing urban rail, it could have happened here – for instance, had the 2000 light rail plan been passed (or a smaller version floated and passed in 2004, as should have been the strategy), the Green Line and the UPRR could both be commuter lines that would supplement it quite nicely. The problem we face now is that the Red Line precludes the light rail we need from ever happening. It’s not a starter; it’s a ‘finisher’, as one of my colleagues on the UTC put it at the time – it ensures that nothing more can be done from that direction (no, not even transferring to a line built to run down Lamar). The CAMPO TWG plan is now our best shot at an urban rail network, but that’s not saying a lot – it’s a very very very very very distant second to rail running from Leander to Airport/Lamar and then down Lamar, Guadalupe, and Congress. As for rail/bus preference, again, this usually happened in cities where rail service didn’t rely on shuttlebuses for transfers. If people prefer rail so much to buses, you ought to ask yourself why we expect them to ride when, uh, they’re going to have to ride buses every day the last leg of their trip. We can’t go back and change 2000, but part of the reason we’re in this mess now is because people believed nonsense about commuter rail in 2004 – and I’m here to make sure light rail isn’t tarred with the same patina of failure that’s about to get applied to commuter rail. (And don’t tell me people aren’t confused; again, this very thread shows that they are). I’m new to this forum so excuse my ignorance, but is it true that the system uses existing freight lines? That would be the reason for the super-limited schedule. In Houston and Dallas, they have dedicated light rail lines that go EXACTLY where people live and work, at all hours of the day and night (including weekends). Dallas is finishing up its third line, the Green Line, with some really exciting stations like Fair Park and Love Field. Until Austin voters approve a real light rail system, this project will just be a half-hearted attempt at commuter rail. I am part of the small minority that is looking forward to the day the trains start running. I totally get the “beta version” concept. I like to say that perfection is the enemy of the good. If CapMetro had to satisfy every single requirement from every single M1EK this project would never leave the planning stage. First of all M1EK – your first objection seems to be that the rail is not perfectly tailored to someone who lives in Leander and commutes to UT. I think that’s just tough. It was stated from the very beginning that this rail’s biggest priority was to relieve congestion on Mo-Pac and I-35 during rush hour. I do agree that the limited scheduling will dampen support, but Misty has already stated that this can be resolved in a relatively short period of time by laying more siding tracks. Also M1EK, as someone already posted, your other biggest (and most frequent) complaint seems to be simply that the commuter rail is not the Light Rail as originally proposed, and voted against by the narrow majority in 2000. You have convinced yourself that no system is acceptable unless it runs down Lamar from Airport to Guadalupe and then stops exactly at your destination on campus. Well I happen to live near Lamar and Airport, and I completely disagree. You cannot even begin to propose laying track along Lamar without disrupting the highly organized and vocal North Loop neighborhood associations, including Allandale, Hyde Park, Crestview, Brentwood, and Highland. These groups are energized from their opposition to WalMart at Northcross, and now seem eager to pick the next fight. Once your track reaches Guadalupe, do you recommend razing the University buildings, or the shops along the main Drag? Or would you rather place the new rail down the middle of the street? Turning left onto campus from Guadalupe is already difficult; it would become impossible with the trains taking up the turn lane and running frequently enough to ameliorate the scheduling concerns of all of the other M1EKs who have posted. You whine that the rail does not service the most densely-populated areas of North Lamar and UT but how do you propose building one without ripping through those very same densely populated areas? For the sake of argument, let’s picture an area in our heads, bounded by I-35, Ben White, Mo-Pac, and Research Blvd. This is the “hot spot”, what Realtors consider to be Central Austin. Notice how except for the 3 commuter nodes between Parmer and Leander, the remaining 6 stations directly service this area. It may not service every single resident or tenant in this area, but that’s not exactly the point. I happen to live within walking distance of the Crestview station, and I gotta say, I absolutely adore this station. I love the adjacent mixed-use development, the way it projects such a dynamic, vibrant, and yes *URBAN* feeling, of a city that is transforming itself from hippy college town to cosmopolitan oasis. I am pretty sure that the TOD is exactly the point. The rail is not just to get people to switch from riding the bus (or driving) — it is to foster sustainable growth, in which home buyers have the option of lofts or condos or single family residences, all within walking distance of shops, dining, and commuter rail. If I didn’t already own a home here, this is where my housing search would start (I bought my house in January 2004 and my home value has more than doubled in 5 short years — I am shamelessly biased in favor of MetroRail partly as a result). I am not an employee of CapMetro or Trammell Crow, but sometimes I almost wish I were. I do have every intention of finding a job in a location that is serviced by MetroRail. In fact I just had an interview today in an office building near the Capitol. I picture myself every day starting my commute by walking to the station, riding the train downtown, and finally taking the shuttle to my destination. I plan to take full advantage of the exercise and friendly faces, and You bet I will be smug and self-satisfied after I get rid of my car and reduce my carbon footprint. As a last thought, if you have ever met a 4-yr old (boy perhaps? ), and a 64-yr old (man? ), I’ll bet one thing they have in common is that they both collect trains, with varying degrees of obsessiveness. There’s just something about trains. Mustard — have you seen the pictures of the train? Does it really look like it’s intended to cart drunks home from 6th street at 3AM? Never going to happen, so give that one up.